The choir is now on its summer break. Details of social events will appear in due course on our news page, and rehearsals for our Christmas concert start on 3rd September 2019. 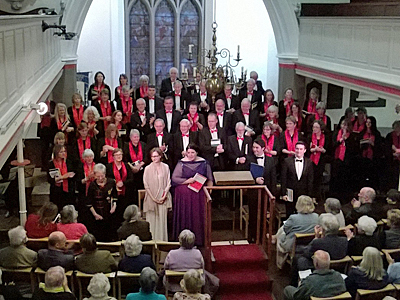 The Hayfield Singers are a keen amateur choir who rehearse and perform two concerts annually in St. Matthew's Church, Hayfield, Derbyshire. The Singers were formed by Jonathan Holland and the late Tricia Howitt in October 1992. They gave their first concert in December of that year. The Choir welcomes new members at the beginning of each term (January and September). No audition or previous experience is required: you just need to be able to pitch. Rehearsals are held on Tuesday evenings (during the winter and spring) at 8.00pm in the Church Hall. The Choir is accompanied in concert by the Hayfield Ensemble, who are members of, or associated with, the BBC Philharmonic and the Northern Chamber Orchestra. The choir performs a wide range of the classical repertoire from Monteverdi and Schütz, Bach and Handel, Haydn and Mozart, Schubert, Mendelssohn, Finzi and Britten and carols old and new at Christmas. For further information please contact Pennie Roberts ().